We are living in the Anthropocene, a period where humans are the dominant force on Earth’s natural systems. Coral reef ecosystems are no exception. Widely known for their striking beauty and diversity, coral reefs also have great social, cultural and economic importance. At human-populated islands, small-scale and subsistence coral reef fisheries are often vital sources of protein and income. However, it is widely recognized that even relatively low levels of fishing can have large impacts on coral reef fish stocks. How can scientists effectively measure the status and therefore sustainability of coral reef fish populations? One would think that an isolated reef ecosystem shielded from the influence of people would provide an ideal benchmark against which other coral reefs – and their productivity as sources of fish – can be compared. But in a recent study, we found that it is not that simple. Using data collected by scientific divers at nearly 2,000 sites at islands and atolls across the western-central Pacific, we developed a method for separating human from other environmental factors to assess reef fish status. We found that not all coral reef areas have the same ability to sustain stocks of fish, and what constitutes “natural” varies substantially among locations. A prerequisite for effective coral reef fisheries management is to know how the current status of the ecosystem compares to its ‘pristine’ state. In other words, what would local fish stocks be like if humans had not affected the system at all? For coral reef fisheries, estimating pristine reef fish biomass has been difficult. Unsurprisingly, where you have more humans, you tend to get fewer fish. Yet to compare a remote reef, distant from human impacts, directly with a populated one can be misleading because it assumes that what is normal or natural for one area applies directly to other areas. Instead, each area is under the influence of environmental factors that operate independently of human influence. We investigated the relative influence of environmental variation and human impacts on groups of reef fish assemblages. The data set used is a culmination of more than 2,000 hours of underwater visual surveys conducted by NOAA scientists and scuba divers for the Pacific Reef Assessment and Monitoring Program (RAMP). Pacific RAMP divers conducting an underwater visual survey of coral reef fishes. The Pacific RAMP is one of the world’s largest coral reef monitoring efforts, and it is unique for implementing standardized methods and sending core survey divers throughout coral reefs at nearly 40 US and US-affiliated Pacific islands and atolls. The Pacific RAMP has being monitoring coral reefs of the western central Pacific for 15 years, and scientific scuba divers on the fish team are required to know over 600 species of coral reef fish. Over this period, the fish team has counted and sized five million coral reef fish! The islands monitored span a wide range of potential human impact from large population centers, such as Oahu, Maui and Guam, to some of the most remote and pristine coral reefs in the world, including Rose Atoll, the Pacific Remote Islands Marine National Monument and the Northwestern Hawaiian Islands. We paired this unique survey data set with satellite-derived estimates of the environmental conditions at each reef location, including sea surface temperature, wave energy and oceanic productivity – all environmental factors that can influence the composition and abundance of coral reef assemblages. Consequently, we were able to separate the variability in coral reef fish abundance due to changes in large-scale environmental conditions from human-induced variability. By doing this, we were then able to predict what the fish community would be in the absence of humans. Consistent with previous findings, we documented sharp declines in reef fish biomass even at very low estimates of human population density. However, the absence of humans from remote, uninhabited reef areas in the Pacific was not always associated with spectacularly high reef fish abundance. 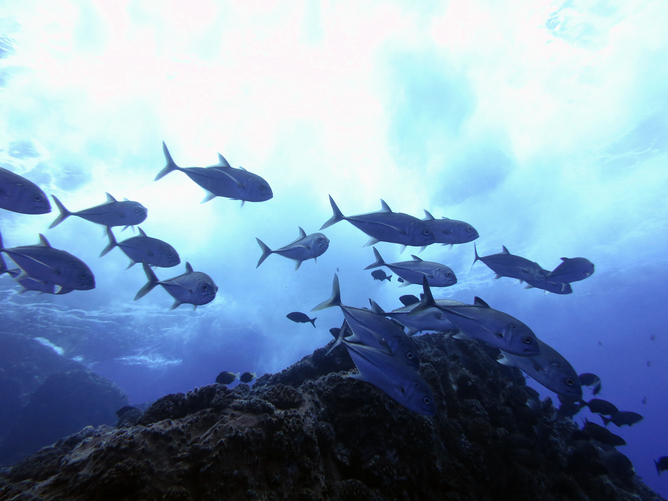 Rather, differences were strongly associated with variation in background oceanic productivity. Coral reefs at populated islands (right hand side, with islands order from low to high human population numbers) have fewer coral reef fish than uninhabited and remote areas (left hand side, with islands ordered from high to low oceanic productivity (CHL)). There exists great variability in the expected reef fish biomass by site that is largely due to natural differences in oceanic productivity. The grey bars are predicted fish biomass in the absence of human impacts. Specifically, areas of high oceanic productivity – that is, reefs in areas of upwelling where cooler, nutrient-rich water is drawn up from the deep to these shallow water habitats – had two to four times the biomass observed in less productive areas. What this means is that no one reef can be assumed the same in its ability to sustain large reef stocks. So using a remote reef in a highly productive region could well be a misleading benchmark toward which fishery managers might strive. Controlling for the spatial variability in reef fish biomass that is due to locally dependent environmental factors, we then projected what biomass one would expect, given the local context, but in the absence of humans (grey bars in the graph above). The findings were stark, with an estimated 20%-78% reduction in reef fish biomass in the lightly to more densely human populated areas. The implications of this work are twofold. Firstly, due to the natural variability among this broadly similar habitat type, coral reefs differ in their capacity to sustain a high level of fish biomass, implying that there is no single target for what a healthy reef should look like. Secondly, our results confirmed that even very low levels of human presence are associated with dramatic declines in reef fish abundance. This suggests that fully protected no-take zones would be necessary to maintain coral reef communities in something that resembles their natural, pristine state. A related and recent global study that also heavily relied upon the Pacific RAMP data concludes that 83% of the world’s reefs have reef fish biomass that is half or less than half of their natural carrying capacity. This groundbreaking study, the first to provide a global benchmark estimate of pristine fish biomass, estimated a recovery time of between 35 and 60 years if fishing was to stop in areas where it now occurs. For most locations, anything approaching full recovery will require prolonged and effective enforcement of fishery restrictions. Ultimately, reef fish biomass targets must be a societal rather than scientific choice. These recent studies provide the basis for properly understanding the extent of anthropogenic depletion of coral reef fishes, and as such, they will allow such choices to be made in an informed manner.